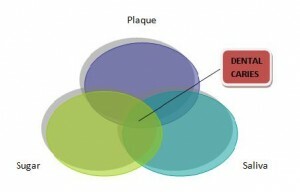 Which Plaque Bacteria cause Dental Caries? The widely accepted theory is the Ecological Plaque Hypothesis, which explains dental caries occur when there is a disruption in the balance of these 3 factors: plaque bacteria, sugar and saliva, driven by a change in the local environment in our mouth. As we frequently consume sugary food (acidic) for example, sweets or carbohydrate drinks, we have created a ‘cozy’ environment to feed on the plaque bacteria. Slowly by time, the growth of plaque bacteria increases and our teeth have become more susceptible to caries attack. The key here is frequent and regular sugar intake to promote that acidic environment! The consequence of this hypothesis is that both mechanical cleaning (i.e. tooth brushing) and some restriction of sugar intake are important in controlling dental caries progression. What happens when there is no tooth brushing? As Dental Plaque accumulates with poor oral hygiene, this will lead to a condition known as Gingivitis or Inflammation of the Gums. You can observe a reddish appearance of your gums, can be swollen and usually it bleeds easily especially when you brush your teeth. 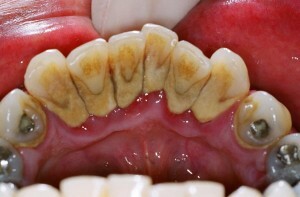 It only takes 2-3 weeks, without any oral cleaning, for it to become an Established Gingivitis. 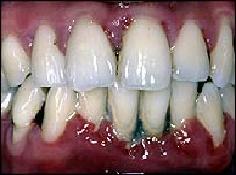 However, Gingivitis is reversible on resolution of the inflammation. Dental Plaque. 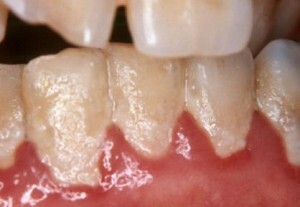 Reddish and swelling at the margins of the gums can be clearly seen on this picture, showing gingivitis. Consequently, with further neglect of oral care, the condition will progress into Periodontal Disease (Periodontitis) or commonly known as Gums Disease. You will notice your gums have receded; teeth become ‘loose’ and sometimes bad breath. All these are due to the underlying destruction of your teeth bone which progresses gradually in a long period of time. Hence, many people are not aware of this condition until it has severed and it is irreversible. For this reason, it is always advisable to see your dentist once every 6 months to get early detection of any unwanted diseases.